William McKee, from Hampden County, Massachusetts was born on July 7, 1922 in Tree Rivers, MA. He was the son of Thomas W. and Margaret (Jenkinson) McKee. He had 4 years of high school education and his occupation was listed as "Skilled occupations in mechanical treatment of metals (rolling, stamping, forging, pressing, etc. ), n.e.c.". 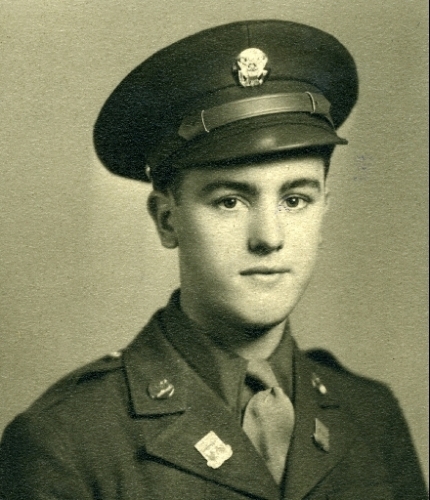 William "Bill" McKee (#31211871) enlisted in the service on October 14, 1942 in Springfield, Massachusetts. In the European Theatre of Operation (ETO), he was a S/Sgt. with the 83rd Infantry Division, 331st Infantry Regiment, 1st Battalion, D Company. William (Billy) McKee, 93, of Three Rivers, died on August 13, 2015 at the Blaire House in Tewksbury, MA after a short period of failing health.